Momentum is a well-studied anomaly where markets with strong relative strength continue outperforming, while weak markets continue to underperform. Gary Antonacci has furthered this area of research considerably by introducing us to Dual Momentum. By combining trend-following absolute momentum and traditional relative momentum, investors can increase their expected return while reducing volatility and severe bear market drawdown. 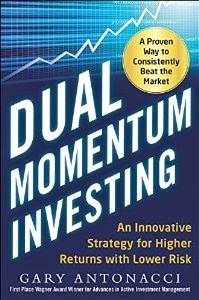 In his book, Dual Momentum Investing: An Innovative Strategy for Higher Returns with Lower Risk, Gary has given us a simple yet robust strategy called Global Equities Momentum (GEM). I have been very interested in implementing GEM but as a Canadian, there are some additional questions that arise. The most obvious question is: How should GEM be implemented by foreign investors? This study is meant to further the research that Gary has presented and help non-US investors to implement GEM correctly. Before we explore GEM in foreign currencies, I will first start off by independently replicating Gary’s results in US dollars. I use the same GEM indices, rules, and back test period (1974-2013) that Gary uses in his book. After alignment with Gary’s results is established, GEM will be tested in the following four currencies: CADUSD, AUDUSD, GBPUSD and JPYUSD. Figure 1 below is a graph of normalized performance for these currency pairs. 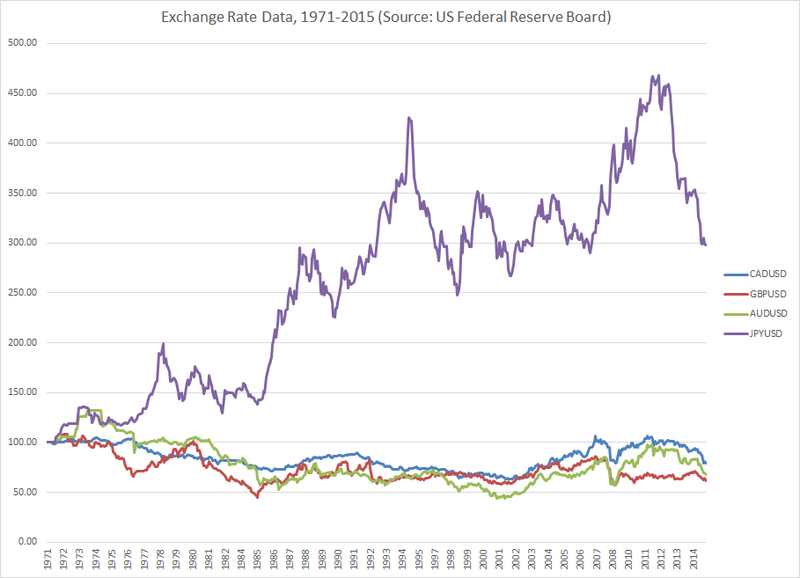 The first 3 rates have fallen between 20-40% since 1971, while JPYUSD has risen more than 3-fold over the same period. When an investor’s home currency falls significantly, the investor benefits by being in foreign currencies. The opposite is true when the home currency rises. Thus, by looking at the chosen currency pairs, we will cover both rising and falling currency environments that a foreign investor can encounter. Data sources were from Standard and Poor’s, MSCI, Bloomberg, and the US Federal Reserve. All data represents total returns with dividends and coupons included. Our back test period is 1971-2014. The start date was restricted by forex data. The Barclay’s US Aggregate Bond Index only has data going back to 1976. I approximated this index between the years 1971-1975 using 5-year US Treasury Bonds. 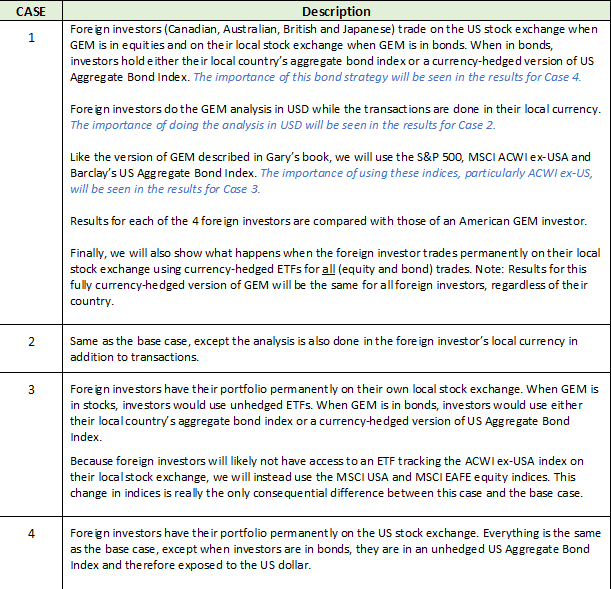 Before doing any sort of currency analysis, my first step was to replicate the results Gary presented in his book and on this blog. Below are my results. These results are the same as those reported by Gary in his recent blog post in which his average annual return is 17.7% and monthly standard deviation is 12.4%. From these results and Gary’s findings, we see that Dual Momentum provides a significant increase in annual returns while reducing volatility. In this section, we look at GEM from the perspective of a foreign investor (Canadian, Australian, British and Japanese). Results are presented for the 4 cases we described in section 2. Foreign investors trade on the US stock exchange when GEM is in equities and on their local stock exchange when GEM is in bonds. When in bonds, investors hold a currency-hedged version of the US Aggregate Bond Index. Foreign investors do the GEM analysis in USDs, while the transactions are done in their local currency. We use the S&P 500, MSCI ACWI ex-US, and Barclay’s US Aggregate Bond Index. NOTE: “GEM (Local)” is when foreign investors trade permanently on their local stock exchange using currency-hedged ETFs for both equity and bond trades. The results for this currency-hedged version of GEM will be the same for all foreign investors, regardless of their country. The model made a total of 49 trades over the 43-year back test (1.1 trades/year). The model was in US stocks, non-US stocks, and bonds for 40.5%, 39.5% and 20.0% of the time, respectively. 1. All GEM versions (USD, CAD, AUD, GBP, JPY, Local) considerably outperformed the stock & bond indices in terms of annual return and Sharpe ratio. Even GEM in yen outperformed with a 16% average annual return despite the JPY:USD rate tripling over the back test period. This shows that every world investor is much better off using GEM rather than a traditional fixed-allocation portfolio. 2. GEM in CAD, AUD and GBP all outperformed GEM (USD) in terms of annual return and Sharpe ratio. This was expected since these 3 currencies fell against the USD over the back test period. GEM (JPY) underperformed GEM (USD). This was expected since the JPY:USD rate more than tripled over the back test period. Would currency-hedging stocks help? 3. GEM (Local) barely outperformed GEM (JPY) but significantly underperformed GEM in all other currencies. This shows that hedging currency on equities should not be done. Doing so would mean you will significantly underperform when your home currency falls and barely outperform when your home currency rises. Let’s elaborate further on observation #3. Why does currency hedging underperform so much? 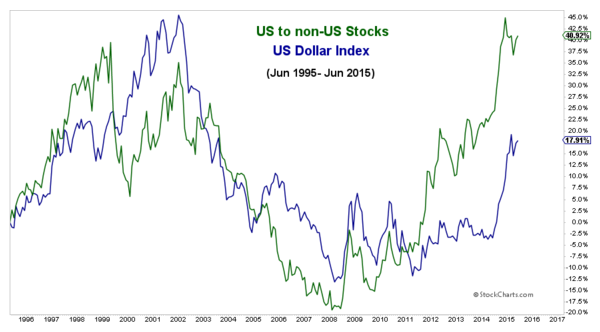 Below is a 20-year chart comparing the performance of the US Dollar Index to the performance of the ratio between US and non-US stocks. Notice the strong correlation. NOTE: Both blue and green lines are displayed in percent gain (since 1995) and smoothed with a simple 10-week moving average. Both the S&P500 and the MSCI World Index ex-US indices are priced in USD. The next step is to see what happens when investors do the GEM analysis in their local currency in addition to transactions, with all else being equal to the base case. Below are the results. We see that by doing the GEM analysis with prices in the investor’s local-currency, performance drops compared to the base case. The annual return drops by average of 240 basis points for the CAD, AUD, GBP and JPY versions. But the standard deviation drops as well by an average of 110 basis points. The Sharpe Ratio drops by an average of 10.6%. Thus, foreign investors are better off doing the GEM analysis with prices in USD. Again, currency hedging the stock indices provides little benefit. We will not be studying it any further. In this case, we look at the results for when foreign investors have their portfolio permanently on their own local stock exchange. When GEM is in stocks, investors would use unhedged ETFs. When GEM is in bonds, investors would use either their local country’s aggregate bond index or a currency-hedged version of the US Aggregate Bond Index. Because foreign investors will likely not have access to an ETF tracking the ACWI ex-US index on their local stock exchange, we will instead use the MSCI US and MSCI EAFE equity indices. This change in indices is the only consequential difference between this case and the base case. 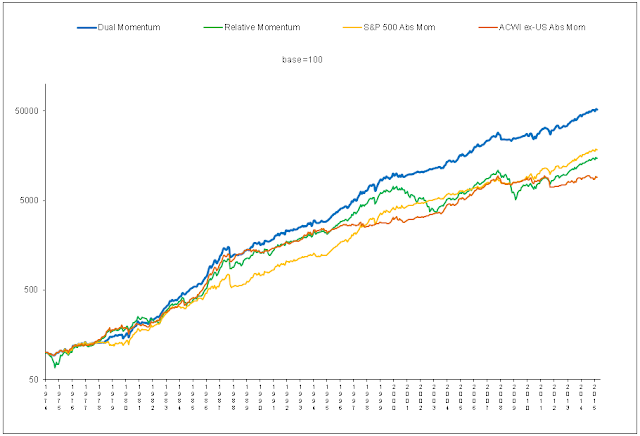 The model made a total of 63 trades over the 43-year back test (1.5 trades/year). The model was in US stocks, non-US stocks, and bonds for 40.3%, 39.5% and 20.2% of the time, respectively. We see that by replacing the S&P500 and ACWI ex-US indices with MSCI US and EAFE, performance drops compared to the base case. The annual return drops by average of 190 basis points for the CAD, AUD, GBP and JPY versions. The standard deviation rises, although only by 20 basis points. The Sharpe ratio drops by an average of 16%. This drop in performance is because the ACWI ex-US index contains Canada and emerging markets besides all the countries in the EAFE index. I recommend that foreign investors have their portfolio on the US exchange when GEM is in stocks (as in the base case). If foreign investors are restricted to only their local exchange, then they should try and find as close of an equivalent to the MSCI ACWI ex-US index as possible. While a direct equivalent is unlikely, there may be an ETF for the World ex-North America index or one might construct a proxy for the ACWI ex-US using multiple ETFs. In this case, we look at the results when foreign investors have their portfolio permanently on the US stock exchange. We assume foreign investors will not have an ETF on the US exchange that tracks their home country/continent’s aggregate bond index. Therefore, when GEM is in bonds, foreign investors will be in the Barclay’s US Aggregate Bond Index and thus exposed to the US dollar. Everything else is the same as the base case. NOTE: The trades made in this case are identical to the base case. We see that by not currency-hedging bonds, performance has a negligible change. Compared to the base case, the annual return increases by an average 20 basis points for the CAD, AUD, GBP and JPY versions. The standard deviation rises, although only by 60 basis points. The Sharpe ratio drops by an average of a mere 2.6%. I expected that results would drop, since when you are in bonds, GEM has no mechanism to control your currency risk like it does when you are in stocks. It is also expected that the performance drop would be minor, since GEM was only in bonds 20% of the time over the past 43 years. The interesting conclusion is that GEM (JPY) was hardly affected despite the JPY:USD rate tripling over the back test period. Because whether you currency-hedge bonds or not makes little difference to performance, I advise foreign investors to permanently leave their portfolio on the US exchange, the same as US investors. This saves the hassle and cost of switching between US and local exchanges every time GEM switches between stocks and bonds. We performed a 43-year back-test of GEM from the perspective of various foreign investors (Canadian, Australian, British, and Japanese). During the back test period, Japanese investors saw their local currency appreciate considerably (over 300%) against the USD, while the other 3 investors saw their local currency fall (between 20-40%) against the USD. In both rising and falling currency environments, we have shown that all world investors can still use Dual Momentum to considerably outperform traditional fixed-allocation portfolios. We see that the ideal way for foreign investors to use GEM is to permanently have their portfolio on the US exchange. Foreign investors would be exposed to currency risk when the model is in bonds, but this hardly affected GEM performance over the past 43 years. This would give the results in case 4. The second best way to use GEM would be for foreign investors to trade on the US stock exchange when GEM is in equities and on their local exchange when GEM is in bonds. In the latter case, investors should either use their local country’s aggregate bond index or a currency-hedged version of the US Aggregate Bond Index, if available. This reduces currency risk when the foreign investors are in bonds, but there would be the on-going cost and hassle of switching between local and US exchanges. This would give the results in case 1 (base case). We realize it is not possible for all foreign investors to trade on the US exchange. The third best way to use GEM is for investors to have their portfolio permanently on their own local exchange. This would give the investor the results in case 3. It should be noted that investors wanting to have their portfolio permanently on their own local stock exchange should not use currency-hedged equity ETFs. Doing so would greatly diminish the relative performance between US and non-US equities. Foreign investors significantly outperform a fully-hedged GEM model when their local currency falls relative to USD. And when their local currency appreciates significantly, the fully-hedged GEM model does not perform that much better. No matter which of the above 3 execution methods are used, foreign investors are best advised to do the GEM analysis in USD. This was shown in case 2. Best wishes to all of you with GEM. Looking at this comprehensive ETF Industry Guide published annually by State Street Global Advisors, we see that there are ETFs tracking some foreign countries’ bond indices, but not all. For example, Canada’s Aggregate Bond Index is not available on the US exchange.